An alleged violent offender was apprehended and a firearm seized after 51 Division officers responded to calls from the public for gunshots in the area of Wellesley St. E. and Ontario St. on August 14 at around 11.50 p.m. The first officer on the scene located a male victim who was unconscious and had a gunshot wound to the neck, applying pressure to limit the bleeding. Inspector Peter Moreira, of 51 Division, said the first officer on scene delivered First Aid until paramedics arrived. The suspect, who fled on foot, was apprehended minutes later. A Walther P99 handgun with ammunition was seized. 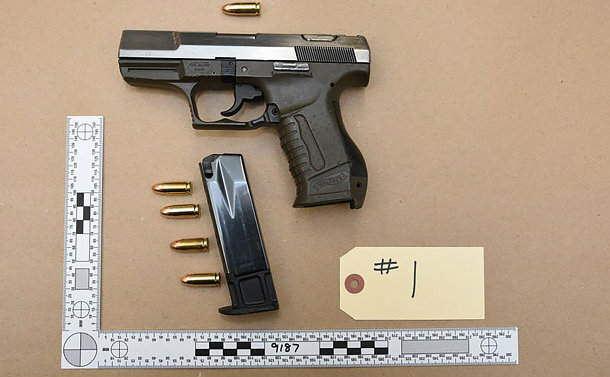 Keeron Creary, 26, of Toronto, faces several charges, including attempted murder, unauthorized possession of a firearm and obstructing a peace officer. Moreira said the suspect was on a bench warrant at the time of his arrest. “We are alleging that this individual is a danger to the public and we are glad we were able to apprehend him,” he added. The victim is in a medically induced coma. Superintendent Tony Riviere, the 51 Division unit commander, praised his officers for the part they played in apprehending the suspect. “They are diligent in what they do and very committed to safeguarding the public,” he said. The Toronto Police Service would like to thank the members of the public that have already provided assistance and ask that anyone with further information please contact police at 416-808-5100, Crime Stoppers anonymously at 416-222-TIPS (8477), online at 222tips.com, online on our Facebook Leave a Tip page, or text TOR and your message to CRIMES (274637). Download the free Crime Stoppers Mobile App on iTunes, Google Play or Blackberry App World.